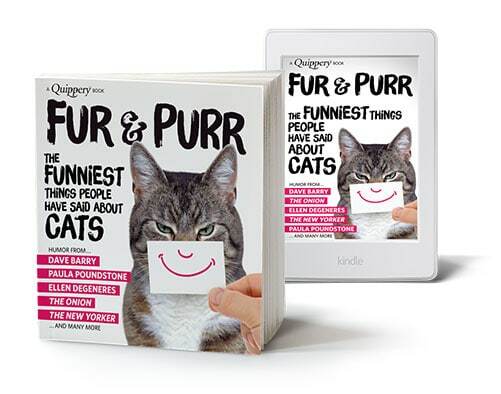 Hours of laughter for any cat lover. This best-in-show humor anthology, beautifully illustrated, includes quotes and articles from Dave Barry • Ellen DeGeneres • The New Yorker • The Onion • Steve Martin • Paula Poundstone • Steven Wright • Drew Barrymore • Mark Twain • George Carlin • Sarah Silverman • Rita Rudner • Albert Einstein • Wendy Liebman • Demetri Martin • Groucho Marx • Patricia Marx • Bette Midler • Rodney Dangerfield • Tig Notaro . . . and many more. Plus hilarious tweets from regular folks like you! Drew Barrymore will tell you about her greatest wish in life (“If I die before my cat, I want a few of my ashes put in his food so I can live inside him”). Dave Barry tells you what your cat really thinks about you (“They’re always watching you with that smartass cat expression and thinking, ‘God, what a cementhead’”). The Onion describes “The Common Benefits of Cat Ownership” (“Cats are adept at defending your home from mouse-sized robbers”). Writer Bud Herron offers practical tips on how to bath your cat (“Know that a cat has claws and will not hesitate to remove all the skin from your body”).